It's been an interesting year so far. It seems that the closer I get to the big 4-0, the more shocked friends and acquaintances are when they found out about my true age. I've seen expressions ranging from speechlessness to the jaw drop effect to outright belligerence that I must produce my driver license for evidence. 1. Live in the U.K because you will have minimal sun damage to your skin. Rainy days: 300 days. Sunshine: 65. Result: The pale faced Cullen family (Twilight). Downside: You may be subjected to SAD (seasonal affective disorder). 2. There are pros and cons to having a round shaped face because every ounce you put on goes straight to your face. It also automatically puffs up any fine lines without you having to resort to botox or getting fat from your arse directly injected into your face. Moon face is so in. Not. If you're Asian, your relatives will be the first people to tell you when you've put on weight. 3. Add a filter - preferably Amaro when you're instagramming. You look 10 years younger (at least!) at a click of a button. 4. Wear glasses to hide lines around your eyes. Don't bother with non-reflective lens. You want people to NOT be able to see your eyes clearly. Why not them see their own reflections on your glasses? 5. Dispense expensive anti-ageing creams or serums. Natural skincare works just as well if not better. And they're cheaper too........which means more money for shoes and bags. YAAAAY! (I use REN skincare and rosehip oil). 6. Find a mom and granny that do not have wrinkles. DNA rocks. My dad will kill me if he ever reads this......... he often gets asked if my mom is his daughter which pleases her to no end but the remark has the opposite effect on him. 7. Turn off anti shake or image stabilizer function on your camera or lens. Sharp and crisp images are detrimental to one's self esteem. You want blurry photos. I would also strongly advice you to overexpose every single shot before posting them anywhere. It eradicates any blemishes and wrinkles in a nanosecond. Great tips Marlene, I woul have put you at 34/35. I've struggled with hitting 30 most people assume I'm 3/4 years younger but I'm not sure whether to believe them -I sense they may be knocking a few years off that they think for fear of over guessing. Although I do believe wearing make up ages most people, all my freshest faced friends wear v little make up - so thats my tip! My mother and both of my grandmothers have no wrinkles, no fine lines, nothing. So I don't get that wrapped up in anti aging because the women in my family just don't age. My hairstylist was joking about it the other day. He's been doing my mom's hair for 30 years and he was saying that she hasn't aged or gained any weight in that time. It's funny. As for me, it can be frustrating when you look as young as I do and you're really little. No one ever believes I'm college age, let alone in my twenties. But everyone tells me that one day I'll be very grateful that I look young. I threw a fit when I was IDed on my 30th birthday. 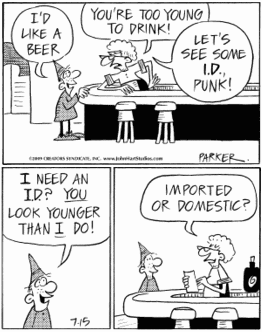 These days, I would PAY people to ask for my ID. So yes, enjoy it while you can. I nearly spewed my tea over my keyboard reading that about your parents! Your poor dad! that is very funnythough. You forgot one extra rule - always take photos from a distance. I am systematically removing all close ups from my wedding album. They are awful! Your sense of humor is awesome! The last tip was the BEST! ;) In any case, I often get asked if I'm a student. Very flattered and I can easily blend well on a college campus so, hey, I'm not complaining! I meant in a college campus. Pfft. Typo! Oh, I concur! I'll be walking around in big, reflective spectacles and using a shaky camera from now on. And finding an older-looking man to hang around with? Maybe not! this is absolutely hilarious. i'll be sure to keep it in mind. Yes I am glad to be blessed with good slower aging genes. Unfortunately, I moved to sunny SE Asia so I suppose that is why there are so many SPF blocking and whitening products! I've just bought argan and coconut oil so we will see how that goes as well! I swear that good sleep, lots of water, no smoking, and good exfoliation help too! You look wonderful and several years younger. I meet more and more forty-something women who look several years younger, thanks to good habits, a lighthearted attitude and good genes I am sure. If you ever saw me without having brushed my hair you'd walk away! Great tips and it made me laugh a lot! Great tips and you certainly don't look your age. I'm curious about the Rosehip Oil .. I'm a huge fan also, but do you find that it wreaks havoc on your pillow cases? Maybe I'm putting too much on my face at night, but I've destroyed more white pillow cases than I'd care to count. The marks do not come out in the wash, no matter how much Vanish I use or how high the temp. I tend to put my own at night but well before bedtime so I've never had that problem before. This post is lovely :) Most of the time I hate living in the sun-deprived UK, but you've given me reason to enjoy it! So do you, S! You did not age one bit since our trip to HK so many years ago! Ah - I'll just get the kids to take my photos then - instant camera blur when they are around. And they make you look really tall too as they are so low down. This is really funny Marlene except you seriously don't look as old as you think you do (or did you know that already??) and being asian does help.. my mum looks like my older sister!